With a small amount of salt sprinkledon your hand, mould the rice into triangles (approximately 8cm wide). You can also use an onigiri rice mould. Create a small hole in the center of the rice triangle and put in umeboshi pickeld plum. Combine cooked rice and yuakri seasoning flakes in a bowl. 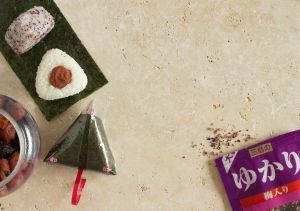 Shape in rice triangles. Using a sheet of onigiri nori, wrap up your onigiri by keeping the plastic wrap.